Religion is defined by most of the secular world as worship of God or an organized way to worship God, involving doctrine and rules. If this definition includes doing no harm but good to others, then Mormons view others' religion favorably. Mormons would much rather see others practice some religion than none. They believe in the right of others to choose which religion they practice. 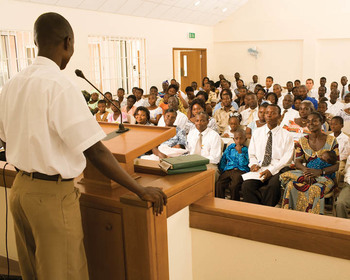 Their Eleventh Article of Faith says, “We claim the privilege of worshiping Almighty God according to the dictates of our own conscience, and allow all men the same privilege, let them worship how, where, or what they may.” Through their own sad experiences of religious persecution, Mormons understand more clearly than many others what it means to be denied this right. Until the last few decades Missouri had a law that allowed their citizens to kill Mormons simply because of their religion. The Mormon religion is the only religion in the United States that has had an Extinction Order executed against its members. While Mormons may disagree with doctrine of other churches, they do not believe in contending—that is, arguing—about religion, because they believe the source of all contention is the devil. They are always willing to reason and discuss, but they are counseled by Church leaders to never descend to heated, antagonistic debate. Gentle persuasion is the answer to the convincing of others, but never hard words and harsh treatment. Mormons believe that is not Christ's way. As Levi Edgar Young said, “No religion made by man can do for men that which must be done” (Conference Reports Oct.1848, p. 94), so Mormons don't believe that other churches, however well-intentioned, contain the power needed for salvation. “There is no salvation in a false religion” (Mormon Doctrine, p. 627). Understanding that this belief may offend members of other churches, Mormons nevertheless don't apologize for the claim that The Church of Jesus Christ of Latter-day Saints is the only true church on the earth. A big statement, but one that was given to them from God, rather than one assumed by leaders or members. Those investigating the Church who hear this claim sometimes mock and are amused, but millions of them have discovered that it is true and have asked to be baptized. Nevertheless having true religion means more than just joining the Church. True followers of religion actively participate and progress. Under the Mormon definition of religion, religion is more than simply theology, “more than a knowledge of Deity and the system of salvation revealed by him; it is the actual practice of the revealed precepts. Religious people are 'doers of the word, and not hearers only' (Jas.1:22-26)” (MD, p. 626). So Church members who are lukewarm, passive, apathetic, and semi-active don't fit the definition of religious people, ones who will qualify for celestial glory, but those who, to the best of their ability, follow Christ as He leads and guides the Church will reap the reward. This page was last edited on 17 July 2013, at 12:58.